Gianni had brought me some leaves he saw in a friend’s garden. One of them, this bronzed and beautiful one of trillions on the planet, is a type of Italian Magnolia leaf, and it managed to convince me to put it in the mix with these other objects to see what would happen. 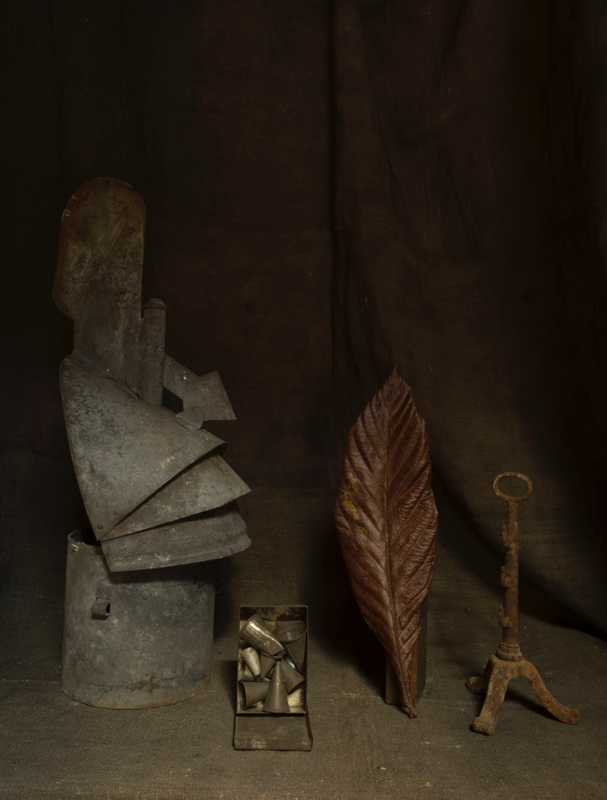 I like this dark setting, it seems to have suited where I was heading with these still lives when I began making them. After all the years of ‘light’ being my subject, darkness descended when I began working inside, and I like it! It continues even now a couple of years later with a whole new series. But these strange personaggi seem to have real personalities when I spend time with them. They show a stronger side now and then, but I have to turn them slowly and watch carefully, just like a moment on the street, the essential quality of their being can be missed in a heartbeat, so close attention must be paid. This entry was posted in Still Life, Uncategorized and tagged Still Life on June 7, 2015 by joelmeyerowitz2014.